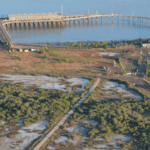 Sheffield Resources has struck a deal with Woodside Energy and Energy Developments (EDL) for the supply of liquified natural gas (LNG) to the Thunderbird mineral sands project in the Kimberley region of Western Australia. Woodside and EDL will supply and deliver 1950 terajoules of LNG per year to the project over a 15-year period. Woodside will supply LNG from the Pluto facility near Karratha to be delivered through a joint venture (JV) with EDL. The JV will create a road tanker fleet specifically for the purpose of delivering the LNG to Sheffield, which will use it primarily as a low-cost fuel source for low temperature roasting (LTR) of ilmenite at Thunderbird’s processing plant. The Thunderbird project is expected to start production in 2020 with a 42-year mine life. Sheffield expects to employ 280 people in full time jobs, with 40 per cent Aboriginal representation within the first eight years. It hosts a mineral resource of 3.2 billion tonnes at 6.9 per cent heavy minerals (HM), including 18.6 million tonnes of zircon, 5.9 million tonnes of titanium-hosting leucoxene, 6.5 million tonnes of leucoxene and 61.7 million tonnes of ilemnite. 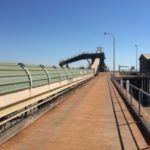 Sheffield received loan approvals totalling $95 million from the Northern Australia Infrastructure Fund (NAIF) and a subsequent mine lease from the WA Department of Mines, Industry, Regulation and Safety (DMIRS) last September. “We are extremely pleased with the level of support shown by Woodside and EDL in delivering a low-cost, long-term energy solution for Thunderbird,” Sheffield managing director Bruce McFadzean said.